In 1748, John Smeaton set up business as an instrument maker in Great Turnstile in the Holborn area of London. His friend Henry Hindley, the established instrument maker of York, supported his 24-year-old protégé by selling one of his own equatorial telescopes to raise funds, and sending Smeaton a description of his method for graduating instruments. Smeaton's first instrument-making success came a year later, when he developed  and subsequently improved  a vacuum pump that was better than anyone had yet produced. The device, also called an air pump, was used to study electrical discharges in conditions of very low pressure (high vacuum). 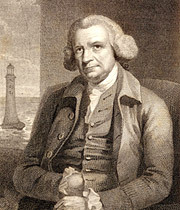 Smeaton collaborated with Dr Gowin Knight (1713-72) on a new mariner's compass in 1750. They undertook sea trials on HMS Fortune in 1751. The compass proved good enough to become Royal Navy standard issue. Smeaton also invented a machine for measuring a ship's rate of travel  a brass spinner driving a counter mounted on the taffrail, comparable with modern commercial devices, although Smeaton's prototype wasn't accurate in heavy seas. By this time he was employing three craftsmen, and in December 1751, he moved his instrument business from Great Turnstile to larger premises in Furnival Inn Court. In 1752, Smeaton conducted a series of experiments concerning the power of water wheels and windmills, using scale models. His formidable intellect showed in his designs for the test rigs and in his analysis of the results. He combined a number of variables to produce the 'worst case' scenario  a practice not common at the time. He also constructed a telescope for watchmaker John Ellicott (1706-72) and a precision lathe for William Matthews. Henry Hindley's dividing engine came into Smeaton's possession in early 1785. Smeaton had admired it since their meetings of 1741 and it was now in need of renovation. The work was completed by March and detailed instructions for its use prepared. It was sold to Thomas Reid of Edinburgh in 1786. Smeaton's career as an instrument maker was impressive in its own right. In a sale of Smeaton's property that took place after his death, a number of instruments are listed. They include a variation compass, a waywiser, his brass endless screw (cut 21st July 1742), his original air pump (constructed 1752), a transit instrument (1768), an acromatic telescope and stand with equatorial motions and micrometer (1770), a celestial globe with brass horizon and quadrant of altitude (1788), and a number of models. However, as well shall see, instrument making was just one element of Smeaton's long and illustrious career in the design of practical constructions.